If you were lucky enough to be born in November, then you have a beautiful quartz gemstone associated with the month of your birth. And definitely not unlucky if you’ve been married for 13 years, as this stone is also the present to give to celebrate this anniversary. Citrine comes from the French word ‘citron’ meaning lemon, which explains its yellow/orange colour, and I think that it perfectly matches the gorgeous autumnal colours of the falling leaves. Natural citrine is quite rare (and therefore commands a higher price compared to other quartz stones), and so would make an extra special present for a November birthday. It began to become popular as a gemstone in Victorian times and is also known as the “success stone”, or the “merchant’s stone”. This is on account of it having properties associated with prosperity and luck, and business owners would carry some citrine with them, or keep it in the till of their shop to attract abundance. Citrine is an idea gift stone for someone that owns their own business, or has an occasion or event which is important for them to do well. Other properties associated with citrine include wisdom, generosity (so if you give it as a present to someone that does well, then hopefully they’ll share their success with you! ), confidence, joy and happiness. What’s not to like about it? It’s also used as a healing stone, and is thought to treat depression, stimulate memory, remove toxins, aid digestion, help fight diabetes, and in general is believed to be good for the heart, kidneys and liver. 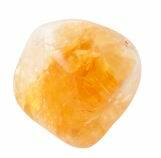 I don’t know about you, but I know I could do with a bit of citrine in my life! If you’d like to purchase a piece of jewellery with citrine in it, then visit my citrine page here, or please get in touch if you’d like me to make a bespoke piece, I’m always more than happy to help. Finally, for those that might already have some citrine jewellery, then it’s important to know that it’s easily scratched, so take extra care with it, and if left in the sunlight for several hours, then it can permanently change colour. If you want to preserve your jewellery, try to keep it away from prolonged exposure to strong light or heat, and enjoy!